Like all of the esteemed writers and loyal followers of this site, I spend nearly every available moment out in the field birding. 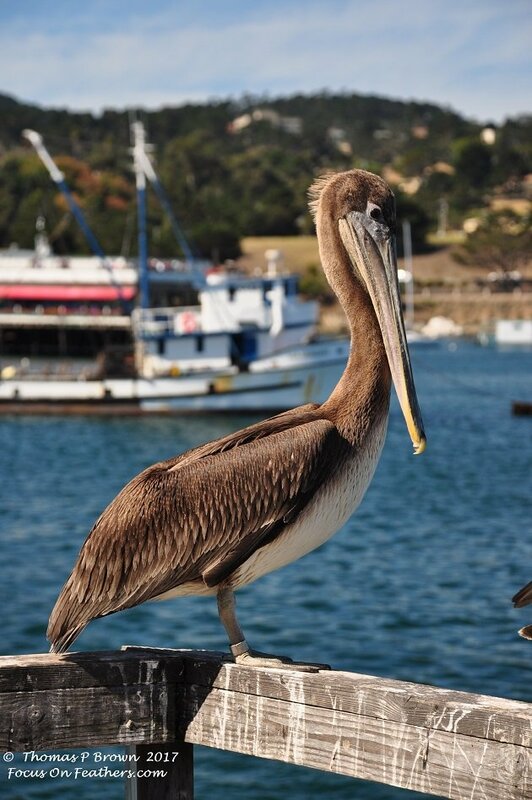 We all have our reasons, whatever they may be, that drives us in our pursuit of these avian beauties. For me, it is now, and always has been about the photography. This lifelong interest ( obsession if you were to ask my wife) has not only allowed me to travel, become much better educated and make hundreds, if not more, friends all around the globe. The highlight of this is that I get to keep learning, learning more and more about birds. New birds, new behaviors, new countries and even new continents. This last weekend I got a whole new lesson in bird banding. Now I have a fairly healthy list of birds that I have found with bands, both in field observations. as well in my photographs. Ducks and geese certainly make up the bulk of the observations. 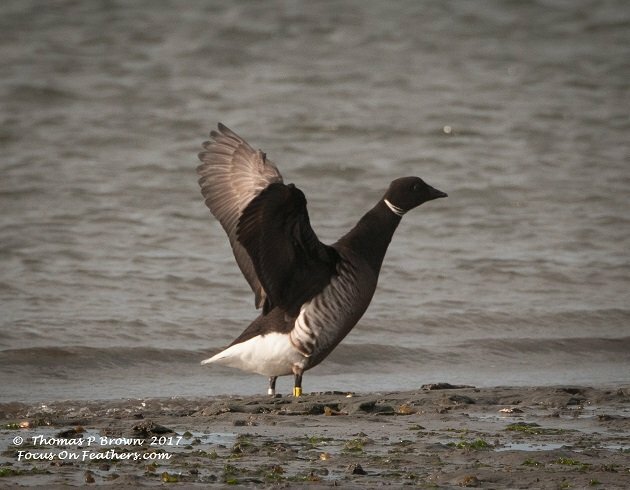 I have over 200 waterfowl that I have recorded those shiny bands on. Then there are those bright colorful bands, most of which have all been in the last ten years or so. Gulls, pelicans, oystercatchers, and a few sparrows. I would guess that at least half of all Trumpeter Swans I have seen have had neck collars. 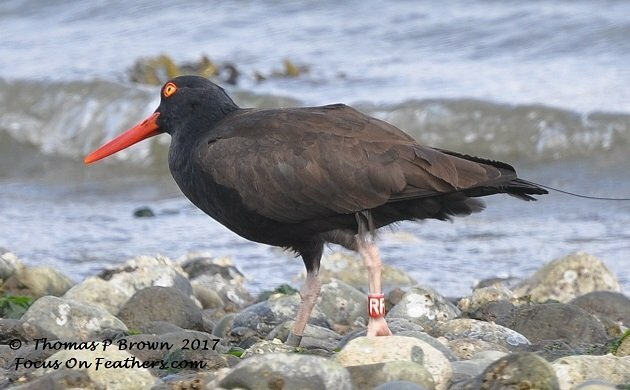 A Black Oystercatcher, seen up in the San Juan Islands of Washington State, not only had a couple of bands, but what looked to be a small wire antenna along its back. 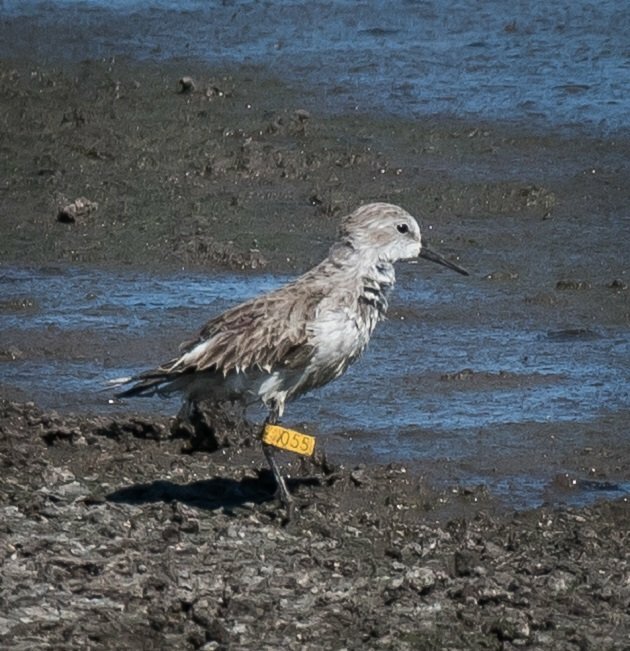 Sunday morning brought a whole new surprise, a Western Sandpiper with a colored flag band. When I first spotted the bird thru my binoculars, I thought it had a small piece of plastic stuck on its leg. Then I saw the boldly printed numbers. 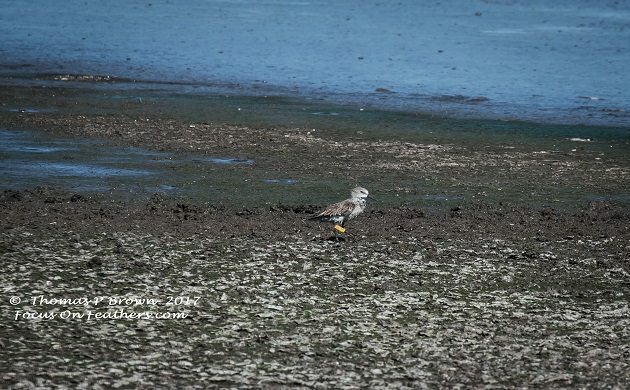 The bird was walking/wading across the muck of the La Paz Waste Treatment ponds. 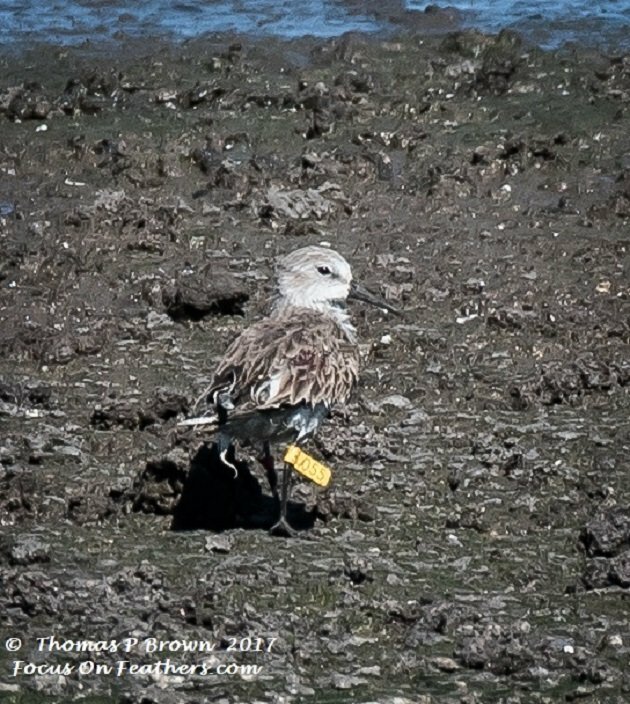 It was not until I was able to get much closer that I spotted the red band on the other leg, as it was somewhat obscured by the “muck”. It was then that I learned about the Pan American Shorebird Program. 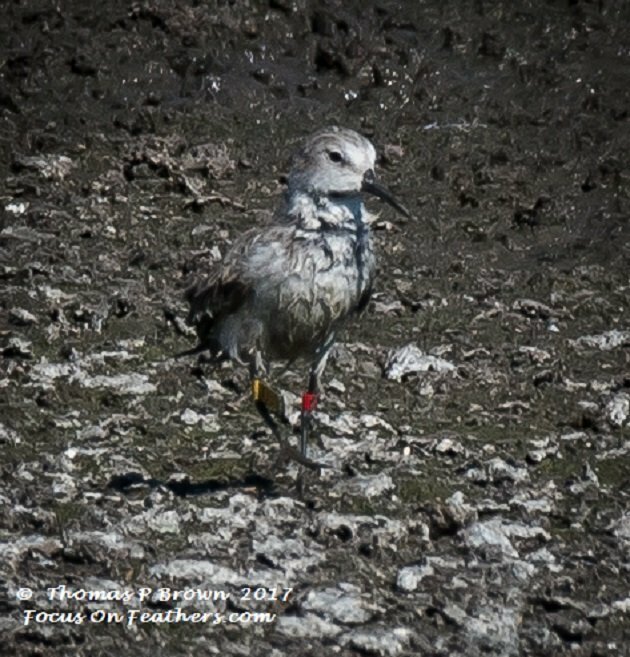 I just got my report off to PASP, so I really don’t know a whole lot about my bird yet, but I do know that it is bird #055, and that its new “Bird Bling” was added in either Bolivia, Ecuador or Peru! With the fact that the birds are all on their return trip south for the winter would love to know how far north this little bird had traveled! To learn more about the PASP, I am adding a link here. My name is Victor Ayala, Im responsible for the the banding program of Western Sanpiper in La Paz, Baja California Sur in Mexico. Well, the WESA with the code 055 that you observed iwas banded in November 2017 in the Waste Treatment ponds. adjacent to Ensenada de La Paz ( 24° 6.459’N, 110° 20.783’W) the bird was male adult. I thank you very much for your information and if you need or you have more information we could be in contact. Spotted a banded Black Oyster Catcher. Red band, lower left leg with a letter R in white. I live on Lopez Island Washington. Any help would be great. Email back bbn please! !